A miniature of larger size, the folio portrays Sikhs’ all ten personal Gurus from Guru Nanak to Sri Guru Gobind Singh arranged in three vertical registers, one in the centre comprising two larger rectangles, while those flanking on sides, four each, and thus dividing the entire canvas space into ten rectangles. All ten rectangles have been conceived like arched pavilions with those in the register on the right having forms corresponding to their counterparts on the left. The painting, seeking to reproduce an exactly alike folio of circa 1880 AD in a private collection at Delhi, both in style and spirit, has been rendered pursuing the Sikh art idiom of Punjab as it prevailed primarily at Patiala and Jammu around the late nineteenth century. A contemporary work, the painting has flavour of the tradition of the past. 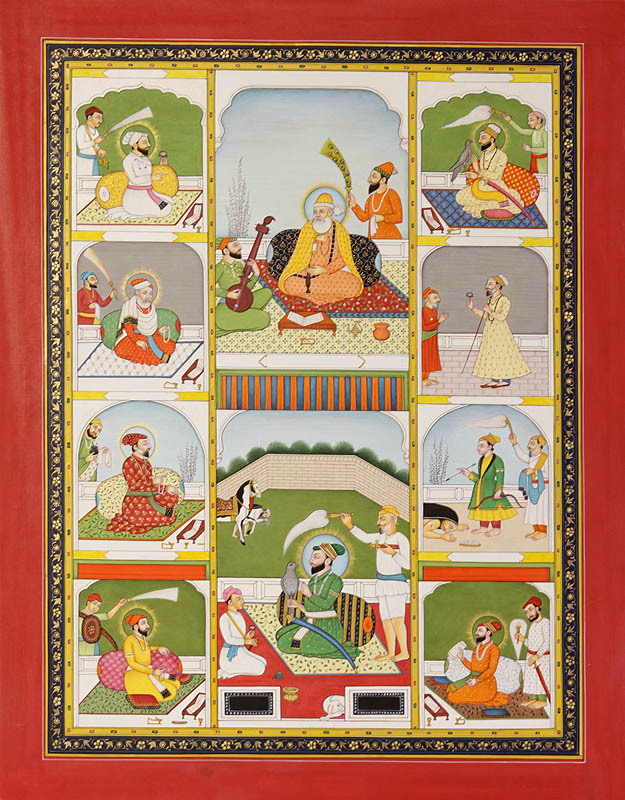 The upper pavilion in the central register portrays Guru Nanak, the first Sikh Guru and the founder of Sikhism, with his two disciples or aides, Bala carrying a morchhala – a flywhisk made of peacock feathers, and Mardana playing on rabbab – a stringed musical instrument. Guru Nanak has been portrayed as holding a rosary in his right hand and turning beads, obviously for symbolising his basic tenet of Nama-simaran – commemoration of Name as the best form of service rendered to the Supreme. Guru Nanak sought to synthesize the best of Hinduism and the best of Islam in his Path of Nama-simaran for symbolising which the artist has included in his depiction one pot such as carried Hindu ascetics, and the other with a spout, characteristic to Islamic tradition, suggesting that under him all religious cultures merged into one. The pavilion under the Guru Nanak’s portrays the tenth and the last pontiff of Sikhs, Guru Gobind Singh with two disciples, one with a flywhisk, the symbol of royalty, while the other, a younger one, perhaps one of his four sons, listening to him in rapt attention, his message to posterity to rise, organise and fight against enemy – the gist of Khalsa, something to which he had not only devoted his entire life but had also sacrificed his all four sons. Guru Gobind Singh has been represented as holding a falcon, the symbol of might, offensive and quick action, and a sword, the symbol of authority and invincibility, tied to his belt. Beginning with the upper most pavilion on the right are Guru Angad, Guru Amar Das, Guru Rama Das and Guru Arjan Deva, and on the left, Guru Hargobind, Guru Hara Rai, Guru Hara Kishan and Guru Teg Bahadur. It was with Guru Angad, a name meaning one born of his own part, which Guru Nanak attributed to Bhai Lahina when he acclaimed him the Sect’s first Guru and his successor, that the Sikhism was truly institutionalised. When he realised through his divine powers that the final extinction was not far, on September 7, 1539, Guru Nanak held a congregation of his Sikhs, called Lahina to dais, placed at his feet five paisa and a coconut and bowing at his feet declared that he was thenceforth the Guru of the Panth. Guru Angad and his successor the 73 years old Guru Amar Das recorded and arranged Guru Nanak’s Vani and also added to it their own verses; however, their main contribution consisted in itinerating and spreading Guru Nanak’s message from one place to other. Guru Amar Das introduced several social reforms among Sikhs and thus Sikhism began developing its own conventions and traditions. 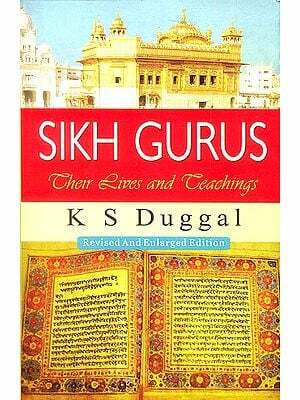 He also built a baori – a large dug-well, and thus gave to Sikh tradition its ever first building structure. Guru Amar Das nominated his own son-in-law as his successor and the Panth’s fourth Guru and thus since onwards the Guruship was confined to family line. Guru Ram Das, the successor of Guru Amar Das and his son-in-law, was instrumental in creating Amrita-Sarovar – the tank of nectar, and a town around it initially named Ramdaspur, nowadays Amritsar, and gave to Sikh Panth its spiritual capital and geographical identity. Guru Arjan, the son and successor of Guru Ram Das not only developed to its full his father’s incomplete Amrita-Sarovar and built the ever first Sikh shrine, Sri Harmandar Sahib but also compiled under the title ‘Adi-Granth’ the Vani – verses of his predecessors right from Guru Nanak, added to it poetry of all great mystics and his own, edited the entire material, set it to Ragas, and finally installed at Sri Harmandar Sahib the sacred Granth as the light of the Supreme. A true saint, providing with food at his ‘langar’ everyone reaching there without discrimination, he one day fed a section of Shahjahan’s rebel army and thus invited Mughal emperor Jahangir’s displeasure with the result that he was tortured to death. It shook his son and successor Guru Hargobind not so much with grief as with rage. He decided to arm himself with two swords, one of ‘miri’ and the other of ‘piri’, that is, one to rule with, and the other, to protect. It was thus that the Sikh tradition acquired a martial aspect that the other successive Gurus, except Guru Teg Bahadur, the Ninth Guru, nourished and held in same significance as the spiritual aspect. Guru Teg Bahadur believed in tolerance and peaceful meditation and made the ultimate sacrifice without a word of reproach. Maybe just casually, no other Guru prior to Guru Hargobind has been painted carrying a sword, something denotative of the departure from the earlier tradition.